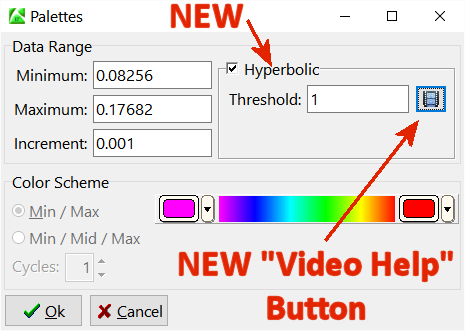 A new feature called “Hyperbolic” has been added to the Custom Color Palette menu. This new feature is used for creating custom color tables in which contour intervals above a specified threshold are scaled hyperbolically (doubled with each interval), thereby shifting the “hotter” colors towards the threshold thereby diminishing the overwhelming effects of outliers (e.g. outrageously high, but valid data points). In the example below, the map on the left uses a linear scale while the map on the right, based on the same grid model, uses a hyperbolic color scale in which the threshold was set to the mean plus one standard deviation. Custom hyperbolic color tables can also be used with 3-D surfaces, voxel model diagrams, and 3-D striplogs as shown by the diagrams below.